My Calendar is a powerful, flexible events calendar plug-in, used by over 30,000 websites. With the Pro add-on for My Calendar, you will increase the power of your calendar by creating opportunities for events submitted by your users, importing events from external calendars, or posting to your blog for every new event. Buy a license for My Calendar Pro and expand your site’s event management options! Need some help with My Calendar, but not the additional functionality? Buy the User’s Guide. What can My Calendar Pro do for you? Let any visitor submit events, or restrict access to some or all logged-in users. 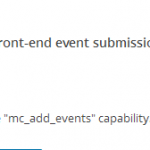 Allow logged-in users to edit their events on the front-end. Want to give your visitors an easy way to submit events? While My Calendar provides a lot of tools for managing and displaying events, you’ll want to upgrade to My Calendar Pro to add support for user submission of events. This extension adds that option directly into My Calendar and many more great features! Test the submissions form before you buy! 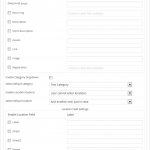 This is a simple example of the submissions form, with most fields disabled; but it should give you some idea of what you can do. After installing, you can create a My Calendar submissions form using the built-in Submissions widget or by using the submit events form shortcode – to make this as easy as possible for you, use the Submissions shortcode generator, found on the My Calendar Help screen. The shortcode generator makes building complex shortcodes easy and quick. 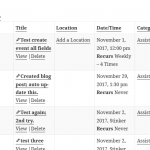 Create a lot of blog posts that are associated with your events? Why not make this a bit more efficient? My Calendar Pro allows you to create new events when you post to your blog. It doesn’t have to be a blog post – you can set this up to be available from any type of page or post. 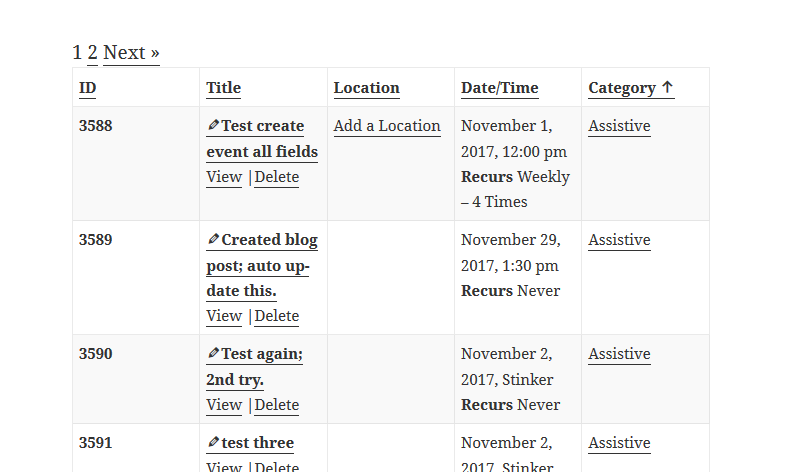 If it makes more sense in your workflow to add blog poss when you publish a new event, that’s also an option! You can specify a variety of custom options and write custom content for the blog post when you create your event. Create a search form where you can search your events, narrowing the search by category, location, author, or between specific custom dates. The advanced event search can be used as a widget or as an independent page. Tables aren’t natively responsive, so if you’re using My Calendar in it’s grid view, then that doesn’t translate very well to mobile. In My Calendar Pro, you can enable responsive mode and select from a new variety of custom stylesheets built for My Calendar or create your own! Using My Calendar Pro, you can import events from iCal formatted files or by creating custom CSV files formatted specifically for My Calendar. You can also import events from remote sources just by providing the URL for the CSV or iCal data. The 25-page User’s Guide to the My Calendar Pro add-on. Support. I provide prompt, personal support. You should submit a support request through the form built-in to your My Calendar Help page, and I’ll respond as quickly as I can. I’m just one guy; so I can’t promise 24×7 immediate responses — but I can promise you that your support will come from the person who knows the plug-in better than anybody else! All the above, but you’ll get updates and support for as long as My Calendar Pro exists. All sales have a no-hassle, no-questions asked 30-day refund policy. Doesn’t do what you need? Hey, that’s fine. Need support? Drop me a line.